Just in time for summer, Anthropologie launches a 15-piece lemlem home collection in the brand’s trademark neon stripes. Browse Savvy Home for a minute, and you’ll immediately see my affinity with lemlem clothing. I’ve featured their gauzy striped pieces incessantly for years. I first discovered lemlem at the Surf Lodge‘s Surf Bazaar in Montauk a few years ago. Their easy-going beachy aesthetic immediately caught my eye and I have been a convert ever since. The brand’s motto “13 months of sunshine” comes from the founder’s place of birth, Ethiopia. Model and activist Liya Kebede’s determination to create a sustainable and empowering partnership with local artisans in her place of birth resulted in the brand all we love today; one that consistently delivers beachy and summer-appropriate attire to wear at the beach year after year. Until today that is. Today might as well be Christmas morning for lemlem fans and I, because Anthropologie has just released lemlem’s first home collection. The 15-piece lemlem home collection launched today and features pillows, bedding, bath and tables linens in the brands trademark neon stripes. Cue angels singing. Here are just a few of the items I’m dying to get my hands on. I’m really excited to announce that my collection of Tini Tables in collaboration with Oomph has launched! I’ve been a fan of this Connecticut based company for quite some time, so I was honored when they asked me to collaborate on a line of tables exclusive to Savvy Home. The Oomph Tini Table collection is perfect in size. It fits in anywhere—it has just enough room for your favorite book and cocktail of choice; it fits perfectly between two chairs in the library or next to your tub stacked with fluffy white towels. When choosing the finishes for the SHB x Oomph collection, I immediately knew that I wanted to go with the signature SHB lacquered chambray blue color with a whitewashed grasscloth top. They come in a quatrefoil shape (pictured above) or in an elongated shape that fits in virtually anywhere. I received my table about a month ago and I’ve been completely in love with the color and the shape. I hope you will love the tables as much as I do! The SHB x Oomph Tini Table II and Tini Table IV are available for sale through Oomph & the Savvy Home shop exclusively. Where would you use yours? I never had the leisure of living in a dorm at university. My mom lived literally three streets away from my campus, and when I decided to move out of home at age 20, I rented an apartment. 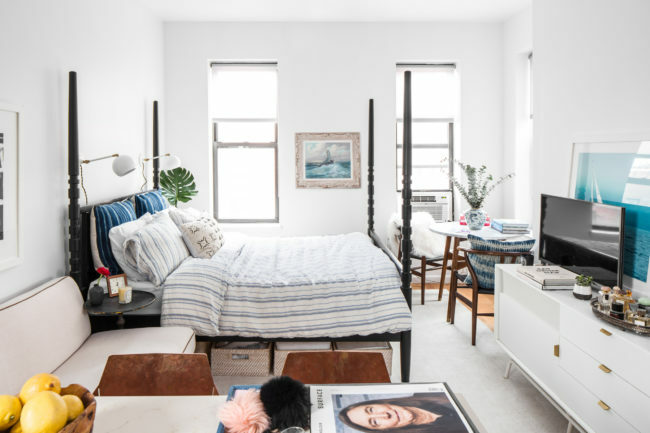 I suspect that in a way though, dorms and first apartments have lots in common: they’re small, not particularly attractive and they require major styling skills to make them feel inviting and pleasant. Since back-to-school season is around the corner again, Camila of Effortless Style organized a fun decorating challenge with a handful of bloggers in collaboration with Crane & Canopy to tackle a dorm room design around the Noe Blue Twin XL Duvet Set. I started with the essentials: a colorful cotton rug to hide ugly dorm room carpeting; a pretty senegalese storage basket for dirty laundry; a nice grosgrain ribbon roman shade that coordinates perfectly with the Crane & Canopy bedding; and a much needed table lamp for a pop of color and flattering lighting. I also added cute artwork for visual interest, a small vanity mirror for getting ready, and a boudoir sham for the bed. For the few students lucky enough to fit a small bedside table or accent chair in their dorm room, I included options for those two. Ahh, much better. Doesn’t that kind of make you want to go back to college days? Below is the week’s schedule. Give these girls some love and check out their designs throughout the week!